I’m on a road trip this week so this is a scheduled post. I’ll answer the comments when I return. In honor of road trips, I’m going to share of few snippets about road trips, roads, and driving. A few years ago, I went on a trip with my dad to Texas. To a Michigander, Texas roads are strange to look at. The bridges, off-ramps, and on-ramps are all these swooping, beautiful loops. Some are even decorated. Ever driven through Fort Worth? 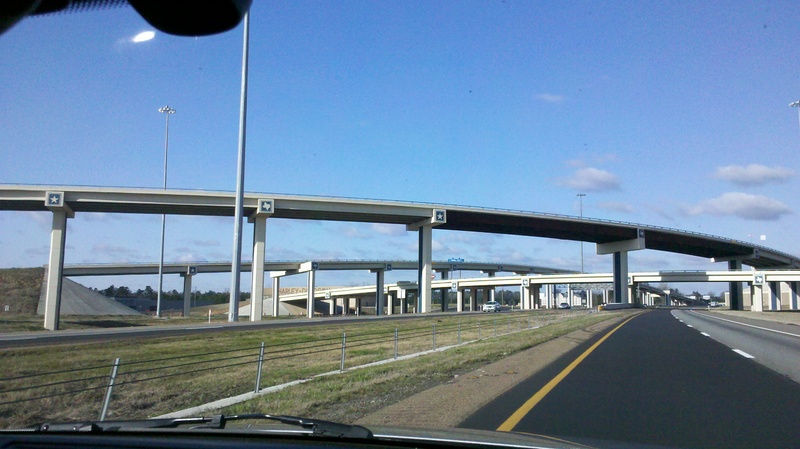 The highways are built in layers, stacked on top of each other. In Michigan, we just don’t build roads like that. All the bridges are built as short and low as possible. There are a few swooping on-ramps, but they have huge ice warning signs and sometimes they drift shut with snow during storms. On that same Texas trip, we were driving a stretch of high way south of San Antonio. The speed limit was 75. My dad was blowing by all the other cars on the road. Curious, I glanced at the GPS, which shows our speed. We were going 70. In Michigan, most freeway speed limits are 70, and a large portion of the population drives at 75 to 80 or more. If the speed limit were 75, then Michiganders would probably go 90. But in Texas, where it is legal to go 75, the drivers go 60. Strange, huh? Maybe it was just that stretch of Texas road. Any thoughts, all my Texas readers? On our way home from that trip, my dad swerved to avoid a pothole. I swayed with the car. Swerving around potholes isn’t something unusual for Michiganders. It is something many of us Michigan drivers learn. If the car in front of you swerves, odds are they are swerving for roadkill, a pothole, or shreds of a tire cut open on a pothole. It’s like a big game of Follow the Leader meets Obstacle Course. Add in a little bit of Memory because it never hurts to memorize the locations of the worst potholes so you know when to swerve without even thinking about it. Several years ago, a few friends and I took a road trip through West Virginia. I quickly learned that very few roads in West Virginia are straight. They twist and turn all over the place through the mountains. At the end of each day, my upper arms hurt from turning the steering wheel and holding it through the twisty turns while going up, over, and down the mountains. Speed limits are a little crazy on some of the back roads. In the valleys, the semi-straight parts of the roads, the speed limit drops to 45. When the road goes up and over a mountain, the speed limit goes up to 55 even though it is physically impossible to actually go 55. I also quickly learned that in West Virginia, the speed listed on the yellow signs is the maximum speed you can go. In Michigan, we look at the yellow speed of 40 and continue to go 50. In West Virginia, I learned really quickly that going 30 when the sign says 20 might not be such a good idea. In fact, it dumps the cooler onto your friend’s lap and cause a lot of screaming. What about you? Any fun road trip stories? Hope you had a good trip! I have five siblings, so road trips aren’t usually fun… 🙂 Where’s your most frequent road trip to? It was a lot of fun. I guess my most frequent road trip would be to my family’s cabin deep in the woods in the northern lower peninsula of Michigan. It’s about a 5 hour drive away. Sounds fun! Glad you had a good time!! Watching other drivers can get very amusing. Though, I have a feeling Michigan drivers probably cause lots of complaints when we visit other states. Especially if there happens to be snow and we don’t slow down. I’ve been to Texas several times, and I’ve always enjoyed it! I guess Texas drivers aren’t that different from Michigan drivers after all, though the Texas driver I passed on the highway this winter might beg to differ (what he was doing up in Michigan in the middle of winter, I don’t know). He looked downright scared to be driving, even though it was a sunny day and all the snow was piled safely on the sides of the roads. Haha! I probably would have been nervous too!! What’s this snow and ice you speak of? lol!! FYI, that cooler is REALLY HEAVY, so having it hit while innocently (for once) staring out the window is both alarming and painful–enough so I soon instinctively shoved the cooler any time we got to turns, and really big turns required bracing myself against the door for a better grip.